An “Anchor,” by definition, is a reliable principal support mechanism that is engaged to firmly secure a secondary object. Anchors typically consist of three main components, the bond length, the un-bonded length (if so designed) and the anchorage. The bonded length is the bottom section of the anchor and is developed in competent rock or soil. The anchor is therefore “bonded” to transfer the load from the anchor into the ground. The un-bonded length of each anchor is free from the sides of the borehole and is therefore free to extend as load is applied to the anchor. The anchorage transfers the applied load to the structure in which is being anchored. Geotechnical construction covers a vast array of anchor applications from simple bar anchors to sophisticated multi-strand anchors. Coastal Drilling East has successfully installed ground anchoring systems for more than 20 years. Our team has experience with a full range of anchoring applications, installation equipment and technologies, and the latest ground anchor testing methods. CDE has installed ground anchoring systems for a diverse portfolio of clients and has provided anchors for both permanent and temporary applications. The CDE team prides itself on being a turn-key provider for this challenging and highly-specialized geotechnical construction service. Look to our team for soil, rock and structural anchoring solutions ranging from simple hollow bar anchors utilizing conventional drilling and grouting equipment, to high-capacity, multi-strand anchoring systems that are custom designed for specific applications, and require specially-designed equipment. With in-house engineers, technicians, specialists in ground anchors, and a diverse set of select outside resources, CDE continually strives to apply the best anchor technology to maximize value for all project stakeholders. By truly partnering with our clients, CDE ensures the development of application-specific designs, and the selection of the proper deep foundation elements. This approach demonstrates our track record of maximizing the benefits of the selected ground anchor system, while mitigating the costs arising from unexpected subsurface conditions. 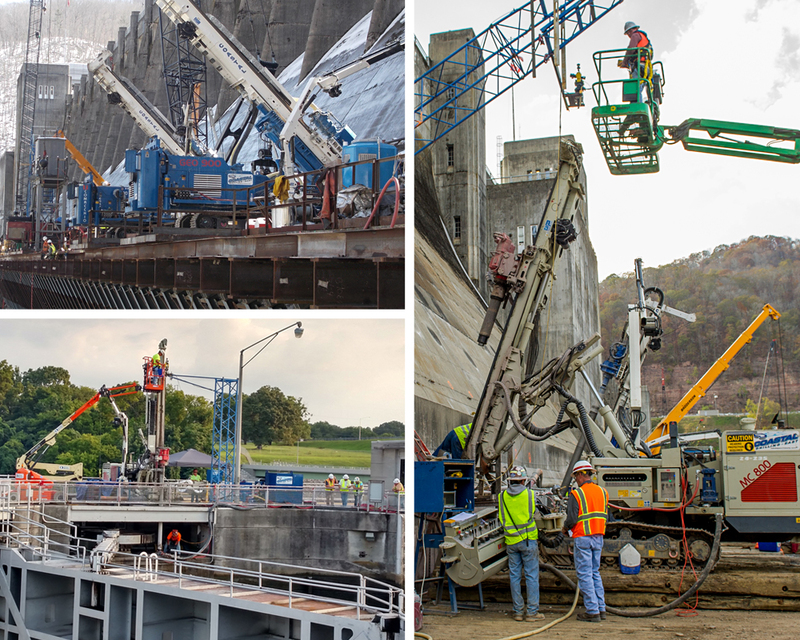 CDE has successfully installed anchoring systems ranging from temporary support of excavations, to large-scale, high-capacity, multi-strand anchors for dams with test loads of nearly 3 million pounds. Every day, on job sites from coast to coast, we successfully complete the most complex projects and overcome the most challenging site and subsurface conditions. Our anchor technologies and systems provide a wide range of options for clients to ensure reliable and cost-effective engineered foundation solutions. Experienced field and office staff provide high quality project oversight. Projects ranging from small to large and complex. “Coast-to-Coast” experience for a diverse range of public and private clients. Successfully installed in a wide range of site and subsurface conditions. Anchor technologies and systems provide a range of options for clients to ensure reliable and cost-effective, engineered foundation elements.